This is a long term review of the Husqvarna Hatchet. I have used this hatchet for five years and in amongst my other axes is the small utility axe that I reach for more than others. 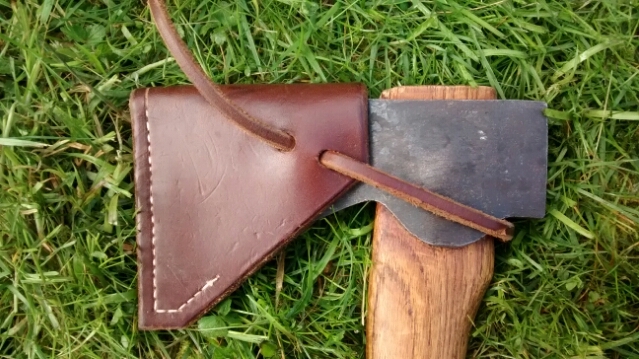 At 35cm long is compares in length to Gransfors Bruks Wildlife Hatchet but the head of the ‘Husky’ is about a 1/3 heavier and much closer in weight to the GB Small Forest Axe. The profile is a little wider making it a marginally better splitter than these other two axes. Of course you would get more power and speed (due to to the longer handle) with the Small Forest Axe. Since owning this little axe I have hardly touched my Small Forest Axe. 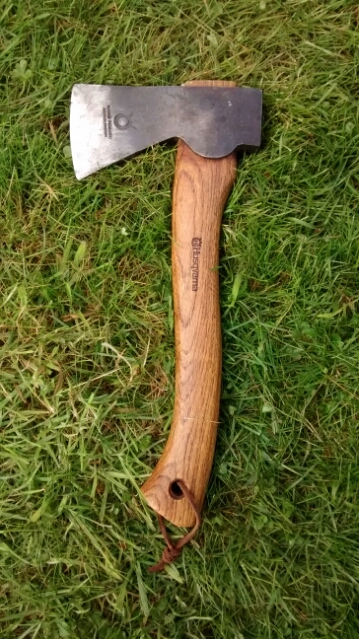 Its unfair to say it replaces it but this hatchet, paired with the larger Husky All-round axe (also reviewed on this blog), meets many of my wilderness needs. When it comes to packing one in my backpack for short trips then I reach for the hatchet every time. It allows me to do all the camp chores, splitting kindling and small diameter firewood, allows me to use for whittling projects and making cooking rigs and shelters, it even helps with skinning animals. At a push I could take down a small tree with it. A perfect little powerhouse. Very back packable – short handle but punches above its weight. Can be used as a little carving axe for spoons etc. However there are better carving axes out there. Cheap – 25 GBP – compare this to GB axes at twice the price. Poor sheath – replace this, make your own or ‘mod’ this one. This entry was posted on Saturday, April 19th, 2014 at 8:40 am	and posted in campcraft, reviews. You can follow any responses to this entry through the RSS 2.0 feed.